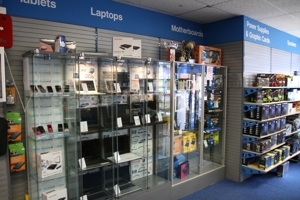 Granthams leading independent retailer of computer systems, PC accessories and components, desktops, laptops and printers for home or business. The Grantham Computer Centre, (known affectionately and locally as the GCC) has been in business, serving the local community since 1989. 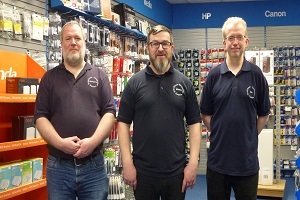 Whether you are home or business user, our experienced staff are here to offer unbiased, friendly and helpful advice, either on existing computer equipment or items you are looking to purchase. At the GCC we stock a wide range of computer Cables + Keyboards + Mice + Headsets + Speakers + Monitors + Webcams + Laptops + Power Supplies + External Hard Drives + Media + Media Cases + Laptop / Netbook Bags + Pen Drives + Memory Cards plus a whole lot more! 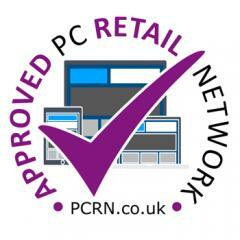 We stock a wide range of computer equipment including ready-to-take-away laptops and PC systems. However should the component or system you require not be available we can normally get the item delivered to us next day (depending on the time of your order). We are part of a National network that specialize in computer repairs. Monitors to mice, notebook cases to networking, hard drives to HDMI leads... and everything in between. A starter PC, a laptop or tablet for surfing and email or a fully fledged gaming powerhouse.. our team can help you get the right kit. 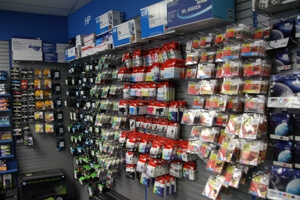 We have the largest stock of genuine and 3rd party printer ink cartridges in the area. Since 1989 the Grantham Computer Centre has been supporting local businesses with their computer and IT needs. From start-ups and SME's, to established businesses with multi-user networks. From a single computer or laptop and printer, to multiple workstations and networking facilities, the GCC is your first choice for your IT and computing needs. Call us now on 01476 404 400 to discuss your business computing requirements or to book an appointment with one of our sales team for a more in-depth chat in-store. Looking for more than just a PC? In association with our friends at Esben Business IT solutions Ltd, a Grantham based company, we can offer businesses real IT solutions. Services such as next generation firewalls to protect your network, virtualised environments that allow rapid disaster recovery and hardware resilience, mail filtering and delivery platforms to ensure you always have great connectivity and much much more.